Our early season berries were wonderful again last year. Big, plump and with excellent flavor. We often heard that “they are the best”, and we didn’t disagree. But we only managed to be open for several days each week during the middle of June. The birds seem to have picked them all as they ripen after that. 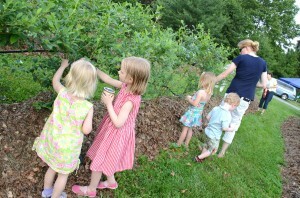 So we are continuing to cut back on the effort we expend on u-pick blueberries after twenty years. The weird weather, the irrigation repairs, the electric fence, the birds, the crab grass and the thistle. People always asked if you can grow blueberries in Maryland, the answer now for the most part “is someone else can”. We still will grow things, but the plan is to just concentrate on vegetables and flowers from now on and sell blueberries and strawberries on a much more limited scale. When there are berries we will post it here on our webpage and notify the folks on our veggie list by email. Sign up if those notices would be of interest. Click on Join our mailing list and you will be added to the list. Check our main page for the latest updates.